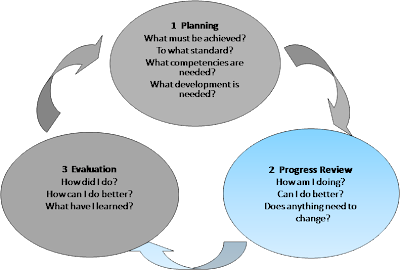 The next step in the Performance Management Cycle is to review progress. Reviewing the employee’s performance throughout the performance cycle is dynamic and vital to the employee’s success. Both the employee and superior should be continually assessing progress achieving in the employee’s goals and monitoring where improvements can be made. Part way through a performance cycle things can change. Budgets can be cut, priorities can change or unforeseen challenges beyond the employee’s control can arise, which will necessitate a change in the employee’s goals and plan. Similarly, it is possible that gaps in the employee’s skills/competencies can be discussed, which will in turn give rise to a change in the learning and development goals for the employee. Clearly establishing the competencies and the actions required for successful performance is an excellent way to support feedback. Firstly, it is important at the beginning of the performance cycle for the supervisor and employee to review expected actions for the employee. Having done this, it then becomes possible to review and discuss throughout the cycle how the employee is doing at displaying the selected level needed for the job. An example of a scaled competency from HRSG’s competency dictionary is shown below. One could argue that Client Focus is needed for most jobs; but for certain jobs - such as Help Desk Agent, Retail Sales, etc. – this competency is particularly important. For the supervisor, having clearly defined the competency level needed in the job takes the guess work out of giving feedback to employees. Competencies also give employees a much clearer picture of the kinds of actions or behaviors the supervisor is expecting from them in their jobs. Let’s take an example of a Travel Agent. I travel all over the world in my role as President of HRSG. I rely on good Travel Agents to get me to my destination in the most time and cost-effective way possible. I expect them to display Level 3 Client Focus behaviors / actions – in other words, I want them to “provide added value” in their service. If I tell them I want to get to a certain destination halfway around the world by a certain date, I need them to provide options. I want an agent that “looks for ways to add value beyond my immediate request”. I recall one situation in which I had asked for flights to a destination on a certain date. The agent came back with options for that date, but failed to tell me that if I travelled the day before, I would have had fewer connecting flights, taking far less time at less cost. Clearly, the agent did not provide added value by looking for ways to address by needs beyond my immediate request; in other words, the agent did not perform to the standard required (Client Focus, Level 3). In a performance discussion, I could use this as a specific example of how the performance expectation was not met, as well as the basis for discussing alternative actions the employee could have taken to meet my needs and to improve performance in the future. In the next in our series of 10 blogs, we will discuss evaluating performance and how competencies support this process. Sign up to our blog’s mailing list through the form on the right-hand side to receive the rest of the series in your inbox.